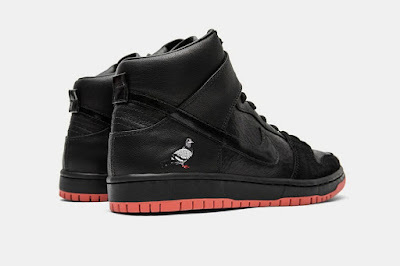 The Real Dwayne Allen.com: Nike SB Dunk High "Black Pigeon"
Nike SB Dunk High "Black Pigeon"
Igniting the hype, the “Black Pigeon” returns — this time in a high top look. Presented by Relevant Customs to Jeff Staple during his book signing at Philly’s streetwear foothold UBIQ, the shoes pay homage to the original design which resurfaced last November. The runners get a black cracked leather treatment sitting on top of iconic red soles. To mark the occasion in the City of Brotherly Love, pony fur is added on the pigeon wings.